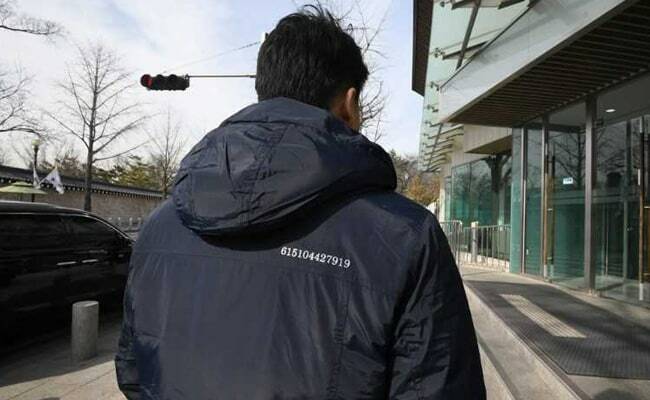 Seoul security officials are wearing jackets embroidered with a secret well-wishing message for Kim Jong Un, deploying a code representing key moments in inter-Korean relations ahead of a summit between the North Korean and US leaders. The dark blue coats — worn by about 10 officers in the Blue House’s National Security Office — have the 12-digit sequence 615104427919 sewn onto the back. The number 615 marks the June 15 North-South joint declaration in 2000, 104 is for the October 4 North-South joint declaration in 2007, 427 is for the historic Panmunjom Declaration on April 27 last year, and 919 stands for the September 19 Pyongyang Joint Declaration that also took place in 2018. “We just hope to keep the positive spirit alive,” one jacket-wearer told AFP. “We have ordered and are wearing the jackets at work voluntarily. It was solely our idea to do this,” he added. A Blue House spokesman refused to say whether the jacket wearers had the upcoming summit between US President Donald Trump and Kim specifically in mind this week as they donned the coats, which they had made last year. Kim is expected to visit Seoul not long after the summit. Cross-border ties improved dramatically as the leaders of the two Koreas met three times last year — twice at the border truce village of Panmunjom and once in the North’s capital Pyongyang — and a reconciliatory push gathered pace. The May 26 summit, the second inter-Korean talk held at Panmunjom last year, was not included on the coats as no declaration was released following the event, the Blue House jacket-wearer said. “We wanted to have these numbers sewn on the back of our jackets so that we remember those key dates and wish our best for the next inter-Korean summit,” he added. He told how one of his colleagues came up with the idea, brought it up during a work meeting and others agreed. During Moon’s visit to Pyongyang last year, the North Korean leader promised to pay a return visit to the South’s capital Seoul. If he visits as expected this year, Kim will be the first North Korean leader to set foot in the capital since the nations split at the end of World War II. Moon welcomed Kim’s comments at the time, agreeing to meet with him “more frequently” in 2019. Kim is scheduled to meet US President Donald Trump in the Vietnamese capital Hanoi on February 27-28, following their first summit in Singapore last year. Critics say Pyongyang has made no concrete commitments so far and is unlikely to surrender its nuclear weapons. Swara Bhaskar’s yellow jumpsuit is so affordable that it’s sold out!